Hello from a now almost permanently light Qaanaaq. The end is in sight, regretfully; we will be returning to London and Copenhagen at the tail end of April. Alex, Anders, Anastasia and I only planned to spend four days in Qaanaaq, we have stayed four months. We planned to walk, ski and snowshoe for hundreds of kilometres north, instead we have covered hundreds of kilometres exploring the Thule region as we trained our own sled dogs (estimates currently at 1100km). The culmination of all that hard work and those lessons learnt could have, tentatively, been a longer journey with the dogs south over the icecap. It was not to be, as I will explain. And as Alex tweeted, we have decided to continue with our more local travels; journeys within 100km or so of Qaanaaq. Ascent onto and descent off the icecap, plus the overall range of our dogs were the main challenges to overcome. Our aim with the latter was to train hard with the dogs everyday and feed them well. We consumed a large amount of information regarding feeding schedules from hunters, papers and friends and are confident we did this well, allowing the dogs to recover fully from the daily runs and put on lean muscle plus a little extra to allow for weight loss on a long trip. The increasing speeds and sled weights the dogs seemed comfortable at as the weeks have passed have been very satisfying to see and seemingly a vindication of our tactics. As our skills and understanding has developed the efficacy of our commands also provided positive feedback. Three multi-day excursions totalling over two weeks of our time here have been spent carrying out reconnaissance of potential access glaciers to the icecap. Our latest was successful. An unnamed glacier in the Olrik fjord, a 70km journey from Qaanaaq, was deemed doable despite the high moraine wall its retreat had left behind. A day would have had to be set aside for some employment of pulleys and relays but after those early difficulties the angle was relatively friendly and the surface smooth, if a little glassy. Planning for the culmination of our time up here has proved less encouraging and contributed to our decision to focus on the surrounding area. The descents off the icecap are varied. Our preferred option, with relatively easy logistics once down, would likely be a mess of melt rivers, thin sea ice and bare rock by the time we reached it. The alternative, while simpler to sled down, would probably require a multiple-leg helicopter lift from the finish point which our funds do not allow. Our quietness regarding our plans was intentional, given the large number of unknowns we faced. The crux of our discussions over the past few days however, have focused on the maximum range that our teams are capable of. If we are unable to cover the distance to our end point, how we overcome the final technical section is somewhat mute. The daily distance achieved is a product of the sledge weight. Well-trained Greenlandic dogs can run all day and pull hard all day given sufficient food but the speed achieved is of course variable. The dogs have been comfortably running our target distances and more on our training trips, with weights close to expedition levels. The almost complete lack of snow in the region; three good days in the four months we have been here, has created a sledging surface far more favourable than that on which we would have spent the majority of our time on the icecap. The intermittent forays we have taken into softer, deeper snow give us a more representative view of our expected pace. This pace has plateaued over the past couple of weeks to give us what we must assume is the best we can hope for. Strong dogs were always going to be assisted by hard-working humans! We had accepted the necessity of a skier up ahead on the featureless icecap to navigate and allow the dogs a track to follow. We had accepted the need to use pulleys and relays to ascend our access glacier. We also knew the three not skiing ahead would likely spend little time actually riding the sled for a sizeable proportion of the journey until the weights had reduced enough. What we cannot stretch to is actually hauling weight alongside the dogs to reduce their load. Our skiing speed and daily distances would be compromised, resulting in more dog food – the majority of the weight – having to be added to allow for the additional days. A compromise has to be drawn between the speed of travel and number of days spent travelling and the best one we can envisage, our maximum range, puts us very close to our actual target destination. We have a massive responsibility for the welfare of our twenty-one dogs. Deciding upon an objective that pushes them to their absolute limit might be acceptable if resupply or non-emergency, self-funded evacuation were viable options in the event of that limit being exceeded before the finish. Either would be financially crippling options for the expedition. The alternative would be to leave our teams on the icecap as we were flown out, having had to put every single one down. If we thought our destination was comfortably within our teams' abilities, things might be different. As it is, we have decided that the possible long-distance icecap expeditions would raise the risk of these unpleasant scenarios unacceptably high. Despite some inevitable disappointment, we knew that we would have to remain flexible and we are not feeling the loss too keenly. There is a huge amount on offer here and the sights of the cliffs, glaciers and sea ice are more than enough to make further trips in the far north valuable. Sandwiched between these we are enjoying the company of an ever increasing social circle of Polar Eskimo (the word is not considered pejorative here) and Danish friends. It is sometimes difficult to walk from one side of Qaanaaq to another without being invited in. We are taking pleasure from seeing Anastasia rebuild her relationship with our dog team and perfect her whip skills. It is a delight, after months of mostly driving solo, to be able to occasionally sit back on my own sledge and let someone else sort it out! An eventful aside... The approach to last week's successful glacier recce provided Anastasia and I with one of the more adrenalin-filled moments of our time here so far. Deep into the fast-ice filled fjord we were happily sledding along a hundred metres or so from the 'beach' when most of the dogs dropped straight through the ice. Looking around we realised we had strayed onto a large area of very thin ice lightly covered in wet snow with almost no demarcation. We instantly made the decision to retreat. The only way to do that was with the dogs pulling, we couldn't just drag the sledge backwards and the dogs out of the water with it. Anastasia held the sledge while I went forward to help the dogs. I fell through up to the chest as but managed to wriggle back on to the ice. We were very aware that if the sledge broke through it would sink and drown any dogs attached. We readied ourselves to lose the sledge and release the dogs if needs be. The hole in the ice was growing as the dogs tried to climb out. We beckoned the dogs, in the water and out, over to one side ready to U-turn the sledge back to safety. Anastasia and I both broke through again but again managed to recover quickly. Just as the runners of the sledge broke through and the back of sledge began to sink, enough of the dogs climbed out of the water and able to pull the sledge clear and follow us as we encouraged them back towards safer ice. Although below minus 25 degrees, as the weather was fine and wind non-existent we spent the rest of the day running and skiing as much as possible to dry out our clothes. Definitely a few brisk moments for us but the dogs shrugged it off in minutes. Oh to have fur! In hindsight, we could have noticed the very subtle tell-tale wet snow and avoided the whole situation but we were not expecting it with thick, fast ice all around and the fjord only a mile across at that point. We later learned that the water is especially shallow at that point and the resultant strong currents leave open water and thin ice all year round. Our closest hunter friend had a similar accident a few weeks previously; part and parcel of travelling on a frozen skim of ice. More to come on Twitter and here in the next few days as we confirm our plans to make the most of the time we have left. In the latest of our extended training journeys, this one had a more pressing mission – the establishment of a route from our coastal area of sea ice, up a glaciated section and onto the vast, permanent ice sheet of Greenland's interior. Previous recces had shown that the very limited sea ice in this area around our base in Qaanaaq, roughly 100 square kilometres, was not going to make life any easier for us than it was for the hunters who call Qaanaaq (pop. 600), Qeqertat (pop. 22) and Siorapaluk (pop. 80) home. It's really a separate issue to the one that caused the shelving of Dark Ice, but one that is making us work hard to find solutions. In order to start a journey with our twenty-one dogs, we need access to the main ice. This trip had our depot of fuel and supplies at Etah as its target. Around a hundred miles north-west of Qaanaaq, Etah is a long-abandoned hunting settlement but in the summer of 2013, we had our depot laid in the one remaining wooden hut there. After the change of plans, recovering this valuable stash has been important to achive prior to leaving Qaanaaq at the end of the month. It also meant using a route onto the ice in order to reach Etah and then later, our main journey path. The trip could have taken five or even ten days, depending on our progress and we hoped to drive the dogs for no more than fifty kilometres per day and we intended to make use of both our Tentipi tent and the handful of tiny wooden hunting shelters used by the Inughuit. The immaculate weather we've had here since mid-December continued as we began to the west, with clear skies, light winds and temperatures around minus thirty degrees. The dogs ran well, if slightly slower than ideal (6-8 kph instead of the optimal 10-12kph) but their loads were above 400kg per team including the three of us. Pinky, who had an infected leg following a bite from, we assume, The Brain, stayed behind and so we were one engine down. Evening number one went to plan and as we had staked our dogs out on their chains for the night, two sleds pulled up by the little hut we were moving into for cooking and sleeping. Our companions in the now snug eight by ten foot shed were a nephew and uncle from Siorapaluk, a waypoint along our route another forty kilometres away. They were travelling to the fishing grounds in the Murchison Sound and were excellent company. We did somewhat envy their polar bear trousers and ability to untangle dog ropes in five seconds flat. Equally, they enjoyed our Biltong beef strips and seemed very keen on our small, efficient cooking stove. Day Two meant a push to Siorapaluk and then beyond, to our primary glacier earmarked for climbing. The hunters had warned us of thin sea ice ahead and to use the narrow ice foot hugging the land as we rounded the two headlands. Sure enough, we saw brand new and pancake ice soon after our start – the 'beach' was the safest route forward. A sled and dogs going through thin ice didn't bear thinking about. We stopped into Siorapaluk around six hours later, the first time we'd seen it after the sun rose in February. A legendary Japanese hunter named Oshima, offered us tea and helped suggest routes on our intended Meehan Glestcher route. A couple of hours later, we were camped in the twilight at the foot of the icefall. It looked steep and not at all what I would call ideal for dogs hauling heavy sleds. The morning would tell. Oshima had also said that the only ascent attempt so far this year had been a man on skis in February, a hunter from Siorapaluk, and he had not been seen since. Bright and early on Day Three I skied off up a snow ramp to try and find a way up smooth, snowy and flat enough for the teams driven by James and Anders half an hour behind. Very soon I realised that we were onto a loser. I was having to work hard to stay safe and make progress just on skis with no sled. The ramps were steep, large areas were glassy ice with no grip and the snow slopes were an avalanche risk – I set off a couple of mini ones just moving across. Even if we got the dogs up ten kilometres of this, using ice screws and pulleys to anchor and haul the sleds on the steepest parts, we would have to come down again a few days later. I could not see how we could control the descent even with rope and chain brakes on the sleds. One slip or loss of control and the dogs could catapult down the glacier in a tangled mess, stopped only by a crevasse or giant boulder of ice. With that and prospect of being stuck on the icecap, unable to descend, we had a team chat at the foot with maps out and decided to move on. By that evening we had moved one fjord west again and way past sunset found our way to an impossibly small hut on a snowy hill near a river delta (from the glacial melt in the summer). The wind had got up, flowing down the Sun and Tugto Gletschers from the ice sheet we had to work hard and fast to stake the dogs out and feed them before diving inside for a well-earned meal and rest. The wind chill was down in the low minus forties with no warm sun to help us. All we could do was retreat to our last camp and make a plan for a long 55km journey back to Qaanaaq the next day, our fifth. The dogs had worked well and were unrecognisable compared to what we began to train in January. They listened to us (occasionally), pulled hard and always gave us their total affection when we were in range... That said, long days still saw a drop off in performance and concentration and so we aren't quite there yet – we also need to increase the loads per team from 400 to 500kg each. Given the kilogram or more of premium food they devour a day, I hope that will be possible! Our return to base was mixed then. We had travelled some of the world's most spectacular Arctic routes, worked excellently as a team – efficient and good humoured even when tired and the conditions were cold and breezy – and were optimistic about our dogs. We had failed though to find a vital route onto the icecap. Our hunter friends can offer no easy solutions. None of them have gone up either yet – crazy given it is now mid-March, and some are reticent even to hunt nearer to home on the unpredictable sea ice. Time is not too short, but is now slightly pressing. One thing we differ on with the locals is that we have schedules to meet – they do not. If the conditions aren't any good, they wait. We can't afford to. Lots of work to do and food for thought, plus we are complete again as a team as Anastasia returns on Wednesday. Over the last couple of weeks the ice in the sound around Qaanaaq and Siorapuluk has been breaking up, and therefore cutting off the route to Siorapaluk via dogsled. We have been advised by almost all the hunters that the best way on to the icecap, for collecting our depot in Etah, is the glaciers around Siorapaluk. But since the ice is gone, we have been looking into finding new route to Etah and one of our options was to follow the coast around to the east and up the Bowdion Fjord where in the spring it is sometimes possible to walk to and up onto the icecap. Just because you are able to walk up it, doesn't necessarily mean that you can go there by dogsled. So we decided to go have a look at the area and see if we could find a way up on the ice and at the same time give our dogs a good training run. We took off Monday morning with our sleds loaded with gear and food for a potential ten day trip, and with one of the more windy days up here in this otherwise weather-stable area and with temperatures down to -31 C, we were keen to get going. But as we have learned over the last several weeks of training, our dogs are less cooperative for the first 30 minutes of the first day on our trips and training days – too much energy! And this Monday morning was no different, we had to walk in front of the dogs to help them a bit with directions. But this day we were really struggling to get the dogs going by themselves and at the speed we know they can do with heavy loads, so we spent a lot of the time shouting 'hak' (to go forward). As every day is with 21 sled dogs something is bound to happen, and this day that something was going to involve the always 'lovely' Thor and me. In a big fight between the two teams which I tried to stop, since I was the person closest to them, Thor mistook my calf for one of the other dogs and bit and shook his head as he likes to do to every dog he can get close to. After a good six hours and around 24 km later (a lot slower than we usually hope for), and in the beginning of the fjord we found two wooden small huts used by hunters where we settled in for the night, even managing to coax the wood burner into life. Tuesday after a wonderful night in a hut, and a beautiful sunrise we were treated with -33 C and almost no wind and a lot of low sun. So we put the dogs back in the front of the sled after repacking them, and sat off to the bottom of the fjords to see whether it could be possible to go over the moraine and up on to the icecap. After 15km or so we reached the head of the fjord and had a good look at the moraine to see if we could find a way up. 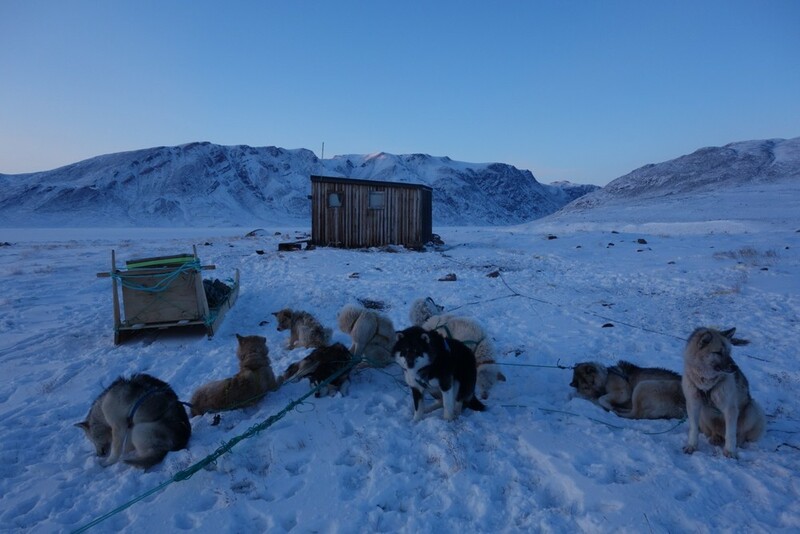 But we had no luck to find a good route for dogsleds (which can't be driven on rock) and therefore we had to turn around and send Alex off on skis for the dogs to follow, and to exercise him a bit, to go back to the hut for another night before heading back to Qaanaaq. For the entirety of Tuesday the dogs were running well and we didn't have to shout commands as much and we had more time to enjoy this beautiful place we are. Wednesday yet another wonderful morning with -33 C, sun and very little wind. After Tuesday's minor letdown of no route on to the ice we were preparing to go home to Qaanaaq. I was going to ski in front for the dogs to follow. After half an hour Alex on the first sled caught up with me and since the dogs were running very well I stepped to the side and let him pass. After another 5 minutes James also caught up with me, but I had to ask him to stop and wait a bit so I could get far in front before he would start again. But the dogs were so well running this day that Alex was long gone and James was always right on my tail. I therefore got of my skis and jumped on to James' sled and we zoomed back to Qaanaaq in half the time we used on the way out. It was an amazing day to be dog sledding and we could enjoy the dogs working their way back to Qaanaaq. 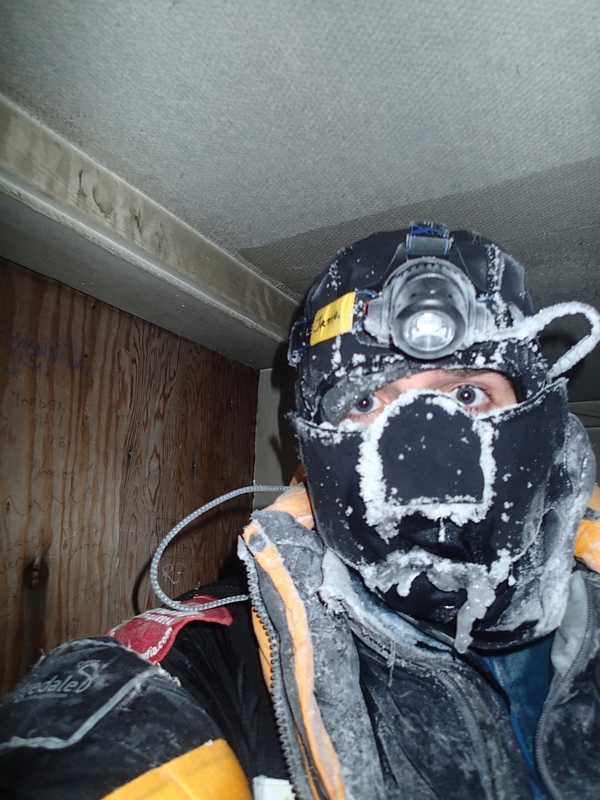 Hello from a sunny (well, for a few hours of the day) High Arctic here in our base in Qaanaaq. The sun has risen since we last blogged (although we didn't actually see that wonderful orb until the day after it officially rose, courtesy of the first cloud we've had in weeks. It was strange to realise how much we had missed direct sunlight. When you don't have it, you just make do, but as it glinted over the mountains to the south for the first time in months, all three of us sat here staring at it almost open-mouthed. There were shadows, real ones, and new colours to replace the black, rich blues and soft pastel colours of the late winter. On the ice and around the settlement, we've been up to our normal tricks, preparing our gear, improving expedition systems and training the dogs. 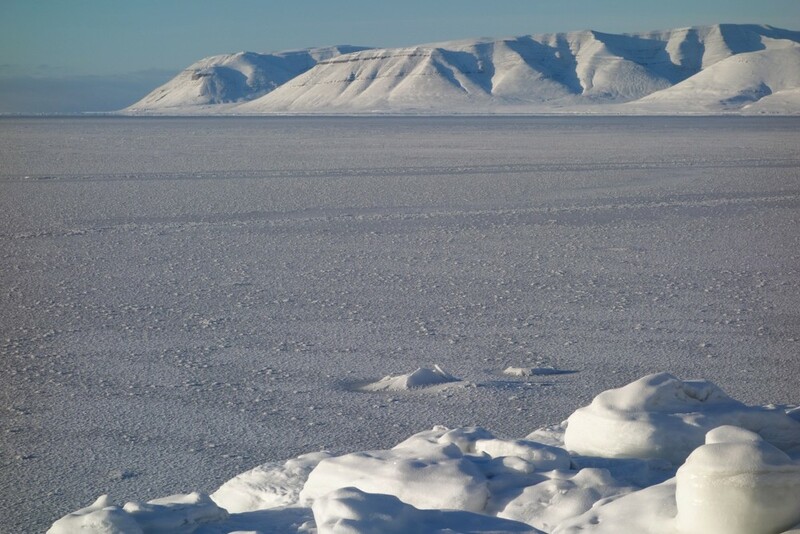 After the return journey to Qeqertat and moving them down off the hill and onto the sea ice, there have been some teething problems as might be expected. Previous non-chewers like Dave have taken to ruining some of our hand-crafted harnesses and some of the dogs who found the trip hard, especially Houdini, are still a little fragile on their feet. 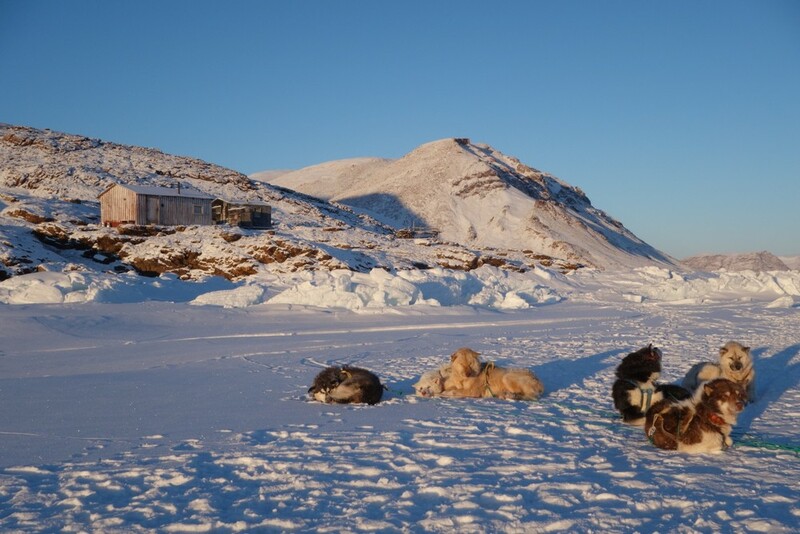 We have ramped up their diet of excellent quality food, seal and fish along with top quality sled dog feed, and given some dogs a few days of rest and recuperation. On Monday we are going on a recce north which may have a lot of possible outcomes. In order to start the big journey at the tail end of next month, we need a good route out of this coastal region and onto the good ice. We also have hundreds of kilograms of important and very expensive supplies depoted at remote locations including Etah and Marshall Bay. This all needs recovering. The odd ice this season has continued to throw up surprises. In the last week or two the Nares Strait finally got itself into a fairly settled state (many weeks too late for Dark Ice to have been feasible but you'll have to wait till the summer for my full, referenced report on that situation). We are going to drive our two full dog teams east from here and up a large fjord north. There are various glaciers there and our plan is to access the moraine (rocky glacial deposits) and potential routes up. These are not first-choice routes but we have to find a feasible way up, and the hunters locally have little need to find routes until March or April when they head north to hunt polar bear and musk ox. Glaciers are crevassed, and my job will be to find and mark a safe routes amongst a maze of large gaps in the ice. Dogs are hard to control at the best of times and our sleds weigh hundreds of kilograms, so precision will be key. It may well be that we, after travelling only fifty kilometres or so, we have to admit defeat on this glacier route and wait for next month and hopefully routes west, but if we are successful then a push north and west to Etah is on the cards. This could extend to being a ten day foray into the polar wilderness at a time when no-one here is contemplating journeys that far. They don't really need to and March and April time is safer with more sunlight, ten more degrees of temperature and some more snow. As ever in the modern world, we need to comply with the rules. The government have been exceptionally understanding with our big journey plans and issued us with an early permit for that, so we must of course stick to the restrictions whilst here training and operating without a permit (which isn't needed here on the coast). This may mean a sprightly push north from the area south of the glacier to above a line of latitude which is a permit-free zone. Either way, the safety of our team and the dogs, as well as being responsible to the community we're part of, must come first. Looking forward to telling you what news we have! We'll tweet live from the ice and check out the website tracker too.